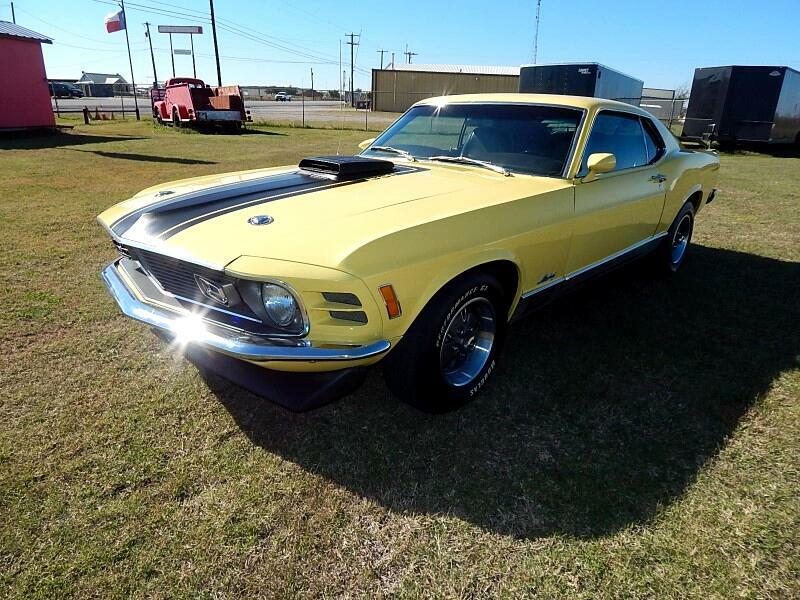 Lone Star Muscle Cars Is Proud to present this Super nice show quality 1970 Mach 1 Mustang. Built in December of 1969, this 1970 Ford Mustang Mach 1 was originally delivered in the Omaha ordering district. Finished in D code Competition Yellow with Black Clarion nit/Corinthian Vinyl bucket seats, the car came equipped with the 351 4bbl Cleveland engine, FMX transmission, power steering, Mach 1 option package, rear spoiler, front spoiler, and black stripes.The car received a complete rotisserie restoration where the car was stripped down to bare metal and built nut and bolt from the ground up. After being taken down to the shell, the Ford received all new bodywork and a beautiful base coat/clear coat paint job in the correct factory color. All of the stainless trim is new as is the chrome. The motor is the powerful 351 Cleveland engine which has the factory compression of 10:1. This particular motor was rebuilt by a Ford engine specialist from top to bottom using factory correct components. It purrs like a kitten and makes awesome power when you get on the gas – as it should! The engine runs well on Pump Fuel With 91/93 octane gas. The engine compartment has been correctly restored using the correct lines, hoses, paint finishes decals. The car has been driven very little since restoration and all of the engine compartment finishes are as good as new. The transmission is a rebuilt FMX with a manual valve body. This shifting configuration really brings the engine alive under harder acceleration yet allows for smooth cruising. The rear end is a completely rebuilt unit which has 3.25 limited slip gears for good hook up off the line.The suspension and brakes received a total overhaul during the restoration and are fresh from front to rear. The correct color for the undercarriage of the 1970 Mustang was actually a mixture of all the factory colors. It comes out as a sort of blackish purple as seen on the undercarriage of this fine Pony car. The Competition Yellow overspray marks have even been replicated and the gas tank is finished in the correct cast silver hue. All of the factory painted inspection marks are in place and the front suspension is appropriately detailed as well. The Mustang is like new underneath. The interior of the car is new from top to bottom and has a set of rebuilt gauges, a restored steering wheel, all new soft parts, all new trim pieces and new carpeting. All of the stainless trim is new reproduction stuff as are the front and rear chrome bumpers. The headliner has been done very well and the car is equipped with the fold down rear seat. Upgraded Sound System With The Factory Look. If You Are a Ford Collector or Just Love Muscle Cars This is a must for your collection. Call Today For More Information Or Schedule A Test Drive.